My daughter was home for Easter weekend so the family enjoyed a rare night out to the movies. The movie “Soul Surfer” had been recommended to us so we chose to attend on Sunday afternoon. I was in a bit of a huff when I arrived due to some family conflict, missing the first part of the movie while I sat and fumed. (Yup… I definitely need to learn to fume a little quicker). Once I started paying attention, however, I really enjoyed the movie. When you “hear again” with a cochlear implant, you really do have to make the concentrated effort to PAY ATTENTION as listening is no longer a passive exercise – rather an active effort. On occasion, I’m lucky to snag a movie we are attending that is open captioned. I do not have to focus with nearly the same concentrated effort when the movie is open captioned. As it was, I finally TUNED IN and really enjoyed the movie. I won’t spoil it for you in case you haven’t seen it, but basically a teenager learns to live life differently due to circumstances that were neither predicted nor expected. She learned that “in spite of” she can continue to make a difference in the lives of others… to touch souls. Individuals with acquired disabilities of any kind have to do the same, don’t they? I mean the alternative is isolating yourself and giving up. That isn’t a life I’d wish on anyone. (Believe me I know, because I tried it for a short time!) It takes a lot of courage to persevere and learn to do some things differently when life throws you a curve ball. I’ve always been a lousy “catch”, so wouldn’t you know when my own disabilities took hold and changed my life that I was totally unprepared? I’ve never met anyone that was not able to MAKE A DIFFERENCE in the life of another. I don’t care who you are or what your circumstances are. The only necessary ingredient to successfully touching the life of another is BEING WILLING. If you aren’t willing, it will never happen. People with acquired disabilities have learned to maximize technology. We have learned to perhaps do something DIFFERENTLY in order to accomplish a task. We have also learned when to cut ourselves some slack. People with acquired disabilities have learned to ask for help at times. We are malleable, persistent, and BRAVE. No worries. I’m not “tooting my own horn” here, I’m simply pointing out the obvious having met numerous people with acquired disabilities. There are numerous ways individuals can make a difference. My “short list” is below. Feel free to leave comments and add to this! 1. Join online support groups and be active in the group. Reach out to others who are perhaps struggling with a new acquired disability. 2. If possible, participate in local support groups or chapters that meet physically each month. Go prepared to learn, but look for opportunities to serve. 3. Be open and honest. Don’t hide the fact on your Facebook. Don’t make your disability invisible. Visibility allows others to see you active in your community, doing things others do without thought. Shopping, church, or GOING TO THE MOVIES are all activities we can still accomplish. Welcome questions and be prepared to be a positive advocate. 4. Have business-card sized cards available to give to people who stop to ask questions about the: Cochlear implant bling, service animal, hearing aids, wheel chair, walker or bright purple cane! In this way they can contact you at a later date and ask questions in a more controlled, confidential way. They may need the information for themselves, or for someone they care about who struggles with their own acquired disability. 5. Don’t apologize for being different. Celebrate it! 6. Advocate, advocate, advocate! When the support groups and organizations to which you belong do annual fundraisers, DEMOS, or community service appearances, do not hesitate to get involved and advocate! At times you will be called upon to write local or state government officials. Take the time to do this! I remind myself as I encourage you to do the same. I need to be be aware on a DAILY basis. I can surf for souls to touch. I can make a difference! Where is she looking? What does she see? Being “aware” is a natural state for me. I think anytime an individual loses one of their five senses, they learn to compensate by being more aware of things around them. When all five senses are working, input is sent to an individual’s brain about their environment, people around them, etc., to help them determine if any action should be taken. However, when a sense goes “missing” as the result of acquired disability, accident, or illness, individuals have to learn to compensate. Now that I have Chloe (my hearing assistance/balance assist dog partner from Fidos For Freedom), I have changed from a hyper-vigilant state to simply being more aware of my surroundings. You see, now I depend on HER. If I’m watching my partner as I should, she hears and then sees things I often miss. I’ve learned to pay attention to her body language and cues, as well as visual focus and reactions to stimulus around us (such as a sudden, loud noise). Do you know my blood pressure has gone down since I’ve been matched with Chloe? Hypervigilance is a negative state of being. “I’m sorry – I’m deaf”, I replied. She had the good grace to at least blush, pushed her cart and hurried away. I was so shook up that I left my cart where it stood, gathered my things, and left. I vowed from that day forward that I would do everything in my power to make my invisible disability more visible. I went through a fairly stressful number of months after the incident and became hyper-vigilant whenever I left the house. I stayed in a state of exhaustion because of it. Enough time went by that I eventually learned to relax a little and just work at picking up good awareness habits. I wear my hair up so that the technology I use is visible. In 2005, I was implanted with a cochlear implant that served to reduce my tension even more since I re-gained the ability to hear. After I was matched with Chloe, “being aware” became even easier. In training, an oft repeated phrase we hear is, “Trust your dog”. In the beginning it is very difficult to do because we are not accustomed to doing so. It takes practice to eventually instill the HABIT of trusting our dogs. I got a lot of flack this last fall from extended family members for taking my dog to the hospital with me when my daughter had emergency surgery. My family members who do not live with me do not understand that Chloe isn’t a “crutch” – she’s a tool. I use Chloe to be more safe and more aware of my surroundings. My husband and I very rarely go someplace without Chloe. However, occasionally we do go to places where we leave Chloe at home for her safety. These places may include: ICU areas of a hospital, zoos (where animals may become agitated since they want to eat Chloe), or to places that may have guard dogs (such as jails, etc.). When we occasionally go to amusement parks, I do not ride fast rides because of my balance issues. However, someone with an assistance dog may determine that these places are not good for the dog to be either. You can’t exactly put a dog on a roller coaster! So when I happen to be without Chloe, my husband has noticed that I am startled more easily because I don’t have anything alerting me to things I miss on my own. I do not take Chloe with me to stores, church, and restaurants when I’m visiting my parents. They do not welcome the attention she draws. It is their home and I respect their wishes. I’ve had folks tell me, “WE will be your ears and watch out for you. You don’t need Chloe”. However, when I’m counting on people to cue me it never actually happens. People ignore many sounds that are just background noise to them. I’ve noticed that my parents can be having a conversation and stop on the curb while I just step right out into the road, unaware that a car was coming because they blocked my view of that direction. I have to be much more careful. I’ve also noticed that as a result of having a balance disorder, I stumble more when Chloe is not with me. In throngs of people, individuals “bump”, “crowd”, and invade the space of people around them because they are in a hurry. When I have Chloe with me, people notice and take care to stay outside my immediate perimeter. I’m rarely jostled or bumped when Chloe is with me. As a result, I fall and stumble less. So Chloe does reduce my anxiety and create a different kind of awareness. I’m aware of HER. I depend on her. Having said all of that, having an assistance dog is not for everyone. In some ways it is like having a really smart toddler around. She investigates things with her nose, and yet I don’t want her to put her nose on every thing we come across. So I have to remind her “head up, Chloe” and be aware of things at her eye level. For example, because it is Easter season, going to Wal-mart means I need to be aware of all of the stuffed bunnies and ducks often at her eye level. Stores put them there so a child will say, “Mommy? Can I have this?” Well Chloe would like them too! So I have to be aware of her at all times. At Fidos For Freedom, teams do a “meet and greet” activity. I HATE THEM. This activity is very hard on the people there who have a hearing loss. The idea is that you put your dog in a safe place and then communicate with another person or a couple of different people in a group. When you have a hearing loss though, you have to see the person’s face if you are in a large, noisy room filled with other groups of people talking. So it is difficult to make sure Chloe stays “safe” and STAYS PUT while actually carrying on a conversation. The activity is one of those “necessary evils” we endure so that we know what to expect in public – in REAL life. I have heard people with hearing loss bemoan how difficult it is to carry on conversations when there is a “hub bub” of chatter around them. Sure, I may have a special program on my cochlear implant to help eliminate background noise, but it is not perfect! It is hard to concentrate on the speaker! Add to that trying to make sure your partner is in a safe place, only adds to the stress level a bit. So although Chloe eliminates much of the stress in my life, it can add to it as well. I don’t know that there is a good solution for “group meet and greet” for a person with hearing loss also partnered with a dog. (I’m open to any ideas though – grin). 1. Am I OK with the attention having an assistance dog draws to me in public? 2. Am I OK with people stopping me and asking what the dog does for me? 3. Am I OK with having to pack a “bag” to go anywhere in order to make sure I have the things needed to travel with a dog? 4. Am I OK with occasionally being confronted and denied access? 5. Am I OK with having to care for and groom a dog daily? 6. (Because of #5), am I OK with having to invest in stock in LINT ROLLERS? These questions and more are important things to consider if you are thinking about getting an assistance dog. For me, the #1 benefit is that I am more relaxed and at ease in my awareness. I no longer feel the need to be hyper-vigilant and I’ve learned to trust my dog. Countless owners have “self-trained” their dogs to perform specific tasks. There are pro’s and con’s to doing so. Private trainers can be expensive, but they can custom tailor a program for the specific needs of a person with hearing loss. Unfortunately, many dogs wash out before they can become service dog material, and a person might go through several dogs before finding one that is right for the work. Self-training is difficult, and also runs the same risk of washing out several dogs before finding the right one. But many who have self-trained their dogs have a strong bond and partnership as a result of this work. 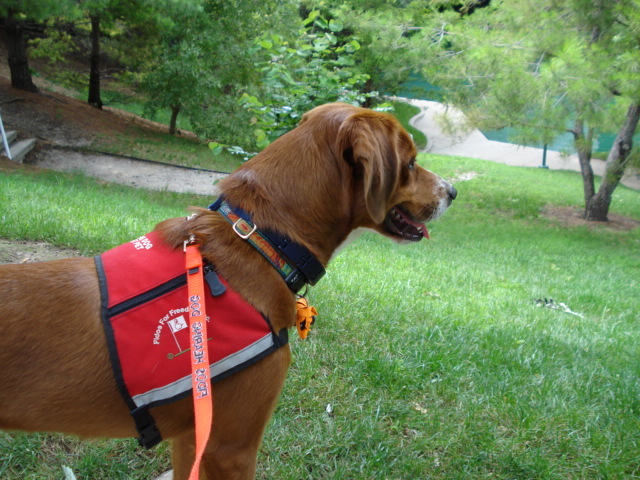 Usually, people who self-train have very good mobility or caregivers to help out, have had one or more service dogs in the past and have had some training experience, even if only with their own dogs. Individuals can hire a trainer as well and some of these trainers assist in “puppy selection”. Many programs offer training and a dog at little to no cost, as they depend on the generosity of donors, sponsors, and volunteers. Others have ways in which you can help to raise money for the dog being trained for you. Feel free to email me if you have additional questions! Disability (grimace). There is a small part of me that cringes when I hear that word, for often it is heard with real (or imagined) inflection that denotes a negative meaning. Occasionally, I get some “flack” from some of my readers about using the term “disability” so freely. Some folks hate the word and avoid it all costs. Others embrace it freely, caring not what the “label” may be since they are struggling to simply cope with WHAT IS. Recently, a fellow client at Fidos For Freedom used the term “differently abled”. I like that! That is the first time I’ve heard that particular variation. 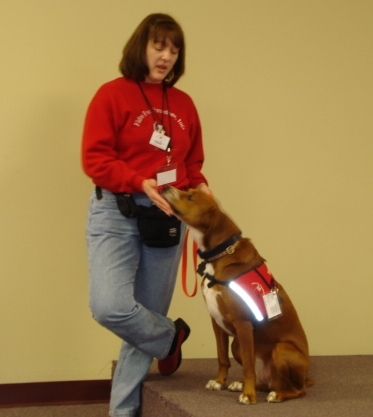 At Fidos For Freedom (where my hearing assistance/balance assist partner comes from), numerous programs are designed to carry the maximum “punch” in creating awareness in our community. One program is the dAP (disABILITY Awareness Program). Demonstrations are given at schools, churches, community groups, fairs, and much more to inform and teach the public about the different types of assistance dogs available, partnered with people with various disabilities. The program focuses on the abilities of all people and how an assistance dog can provide independence to people who do things “differently” as a result of chronic disease, invisible disabilities, hearing loss, mobility challenges, and much more. Personally, I use the word ‘disabled’ freely for it is the wording in the Federal law that protects my rights as an individual who happens to have disabilities. As long as the law uses the term, I will continue to use it in order to identify with my freedoms – not my actual disability. I’m all for changing the term “disability” to something less negative, but until that happens on the federal level – I’m sticking with the term that protects my rights. Labels are awful aren’t they? I actually prefer “person with disabilities” for it identifies me as a person FIRST, and the disability second – as a descriptor, not a noun. I’ve been a member of the American Association for People with Disabilities for a number of years. They have done a lot of terrific work in laying the foundation for future laws that protect Americans who happen to be “differently abled”. Do I hope the word is eventually abolished and changed to something more politically correct? Well sure I do… but in the meantime I will continue to use a word that represents my freedom as an individual with disabilities. Why is the Word So Negative? Many people who hate the word “disabled” explain that it reminds them they are different. Yet we are. Acceptance of that is key IMHO to truly becoming independent in spite of a “disability”. One reader explained, “the word makes it sound as if I’m broken, or flawed”. It’s a shame society (and sometimes our peer groups) create this false picture of what a disability is. Often these negative connotations are the result of interactions with people who do not live with physical, mental, or emotional limitations that require a “new way”. People can be uncaring and mean (and you don’t have to be in junior high to experience this!). Sometimes the most hurtful things are said by people who actually care about us and are struggling to understand. Ignorance (not stupidity) is often to blame. It’s very difficult – but when you have the opportunity to correct and inform someone who doesn’t get it, do so in a proactive (not reactive) way. I try to remember that what I say may influence how this person interacts with someone else who has a disability in the future. I believe that those who are born with a disability have the hardest time accepting the term. For example, I have met culturally Deaf people who really despise the word. (The culturally Deaf are identified with a capital “D” to identify a group of individuals who use ASL as their primary means of communication). I’ve often wondered if deaf people (lowercase “d” to identify adventitious deafness) are more accepting of the word because they experienced “normal hearing” for a time and now understand the difference because they are living WITHOUT a sense they once had? I had a Deaf friend at CSD complain that the word “slapped them with a label that meant they couldn’t do something”. I have struggled to understand that. Deaf (and many deaf) people cannot hear. What is wrong with that? Perhaps their thinking is that by accepting that label it requires the adoption of a number of other labels such as “slow”, “dumb”, “broken”, “reject”, “mistake”, and “different”. People who cannot see well without corrective lenses don’t fear being labeled with other words! Why do people with hearing loss fear that? I don’t hear in a normal way. So what? So what? I don’t center my life around this knowledge, nor do I attach any value to “being able to” as opposed to “not being able to”. I chose to enjoy OTHER things. 1) When I go to amusement parks I’m the official photographer. I ride a great number of rides that do not go “around and around”. I can throw a dart that insures I come home with large, ridiculous stuffed gorillas. 2) I can wash windows on lower levels. 3) I can listen to music and “ad lib” as best I can, but if it is a new song I’m lost. 4) I can be a judge on other types of panels. 5) I can climb on jungle gyms. 6) I can PLAY the piano (took 8 years of lessons!). 7) I can hear SO MUCH now as a result of my wonderful CI! I believe that problem is that OTHERS often attach other meanings to the word “disability”. When they choose to do that, it fosters an attitude of treating a person with disability differently, or of having different expectations of them. Is this where the word “goes wrong”? I welcome your feedback and comments. As long as you don’t swear at me – I’ll post anything even if it disagrees with my own personal opinion. After all, if my desire is that you respect my opinion I can only promise to do the same. So many of you write me to give me “thumbs up”, or “thumbs down” in response to a post. I still welcome feedback privately as well! However, this is a topic I really welcome your feedback for I really am trying to understand everyone’s opinion about this word. I believe voicing opinions about this may help others! So “voice yourself”!